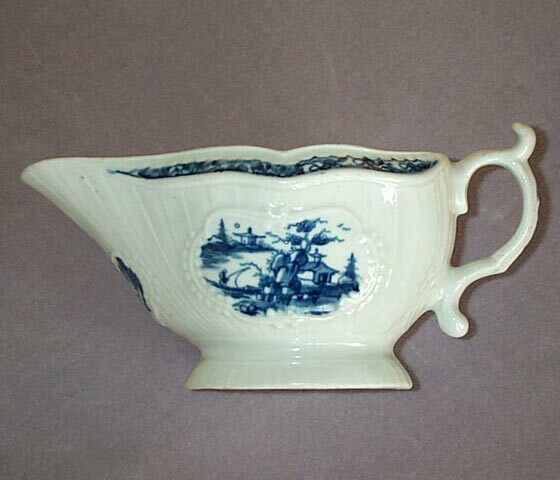 S2756: A Worcester press moulded butter boat painted with the “Butter Boat Mansfield” pattern BFS 1E2. 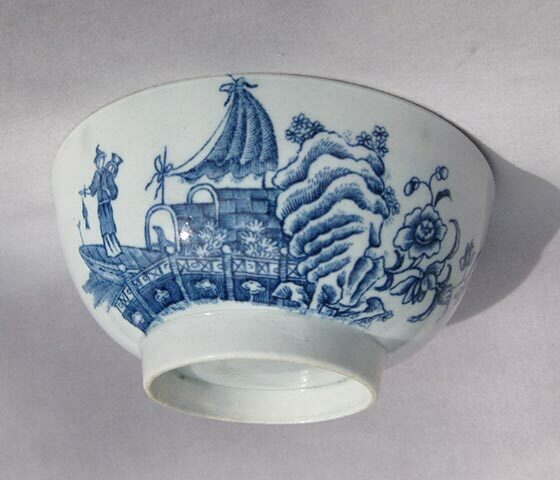 S2289: A Lowestoft tea bowl and saucer painted with the “ Mansfield “ pattern. 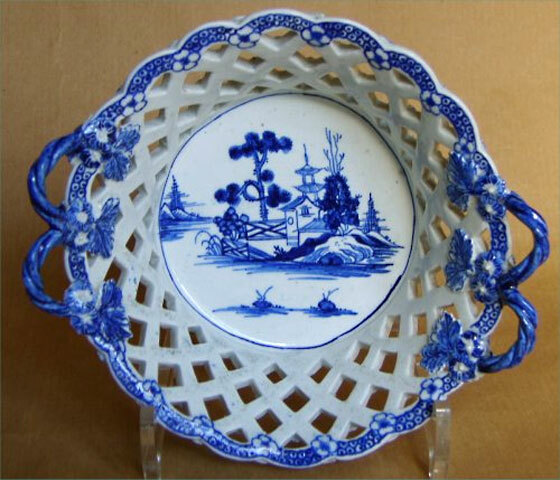 S2516: A Derby blue and white basket with double handles with flowers and leaves terminals and with an oriental garden scene painted to the base. Lattice work sides with flowers at the intersections. 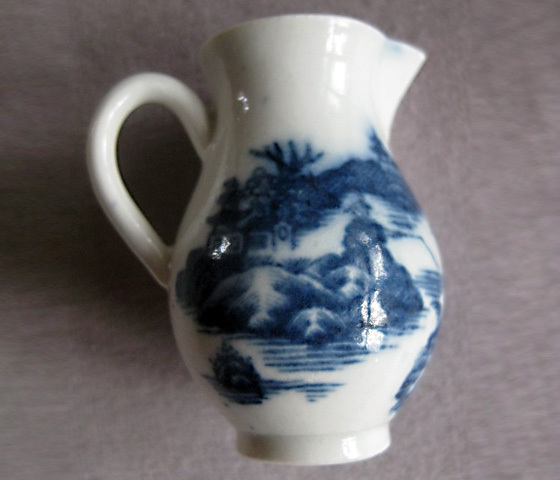 S2771: A rare miniature Caughley sparrow beak jug printed with the “Fisherman” pattern. 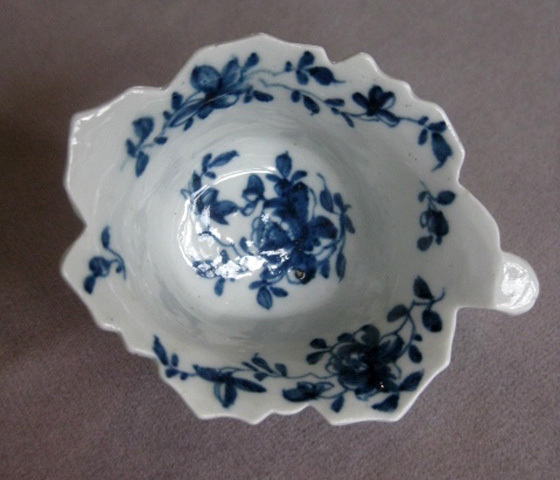 S2543: A rare Caughley asparagus server painted with chantilly sprigs. 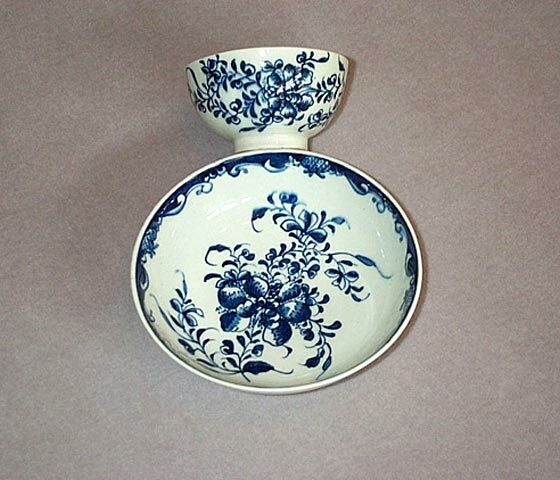 S2341: A rare Derby blue and white pickle dish with a shaped and serrated edge. 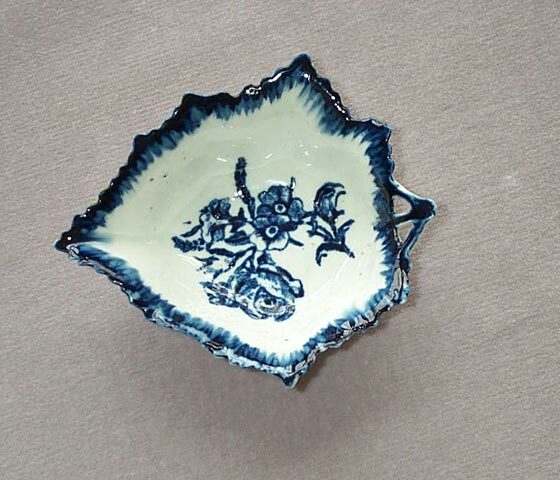 A rose and other flowers painted to the centre and vein moulding to the back. 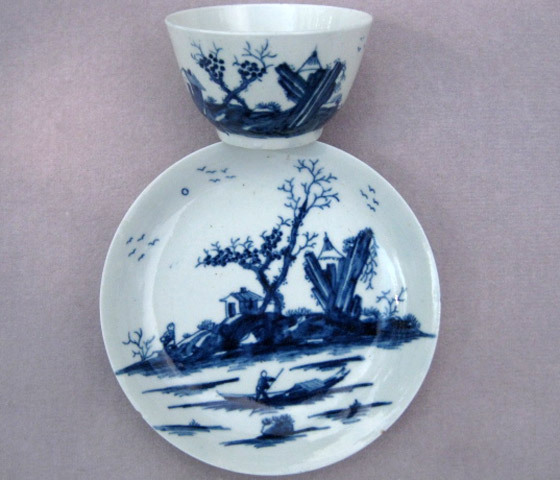 S2358: WORCESTER sauce boat. 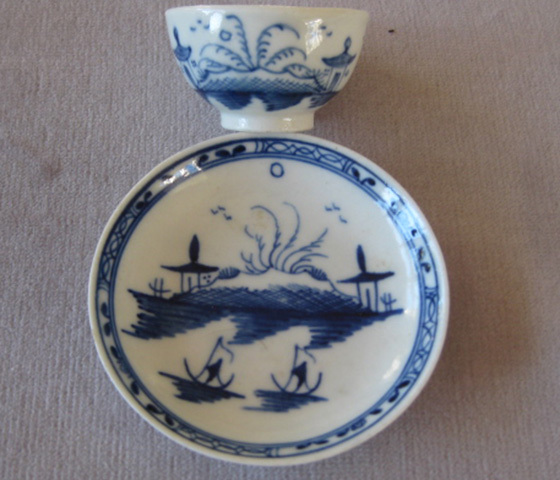 A Worcester strap moulded sauce boat painted with the Fisherman and Billboard Island pattern IB15 . 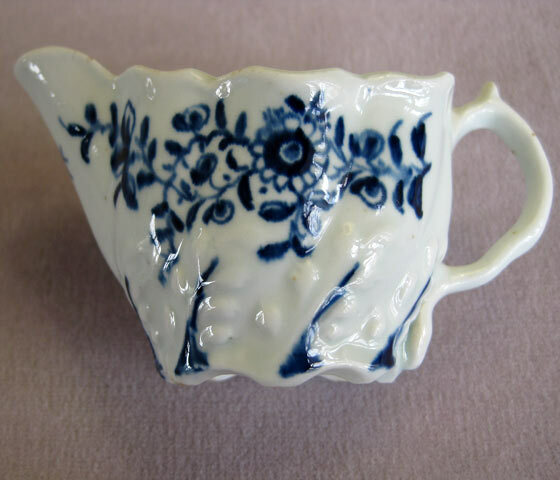 Width of saucer: 2 3/4"
S2383: A Lowestoft creamer of “Low Chelsea Ewer” shape with a moulded body and painted in under glaze blue with flowers and leaves. 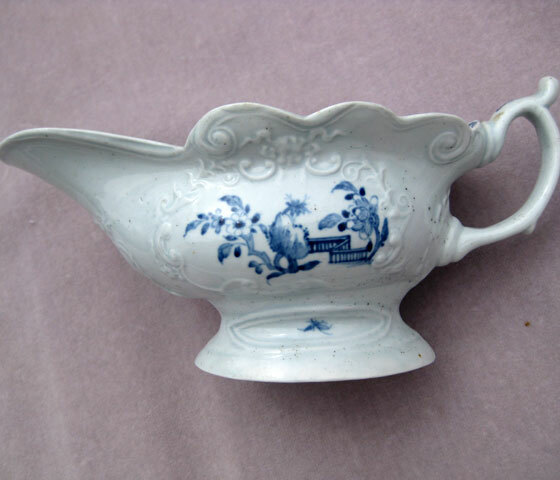 S2442: A Worcester sauce boat with different mouldings to either side . One panel painted with the Zig-Zag Fence pattern and the other with a spray of flowers and an insect. 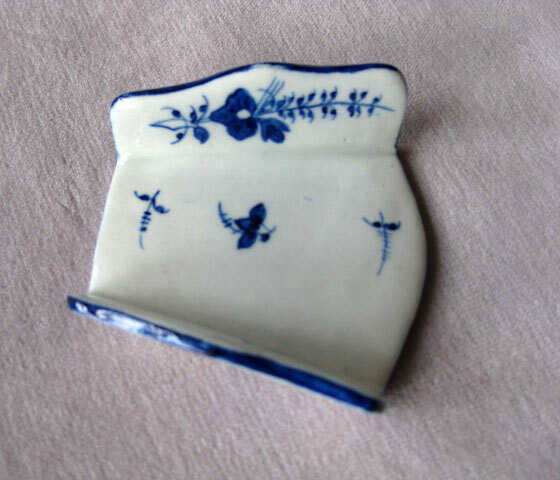 Further decoration to the inside edge and handle. 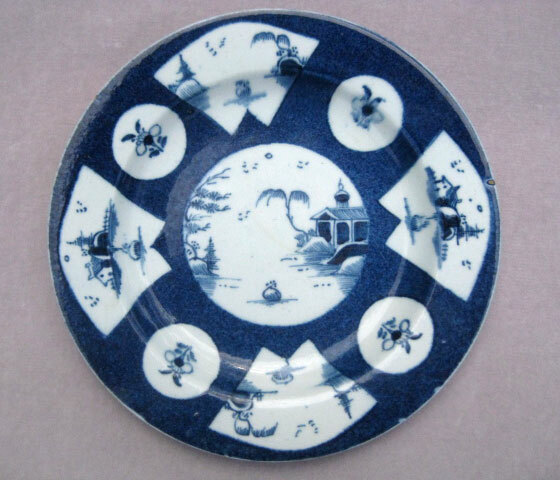 SC104 : A Bow powder blue decorated plate with fan and round shaped panels to the border housing flowers and pagoda scenes and with the centre painted with a pavilion in a garden setting. 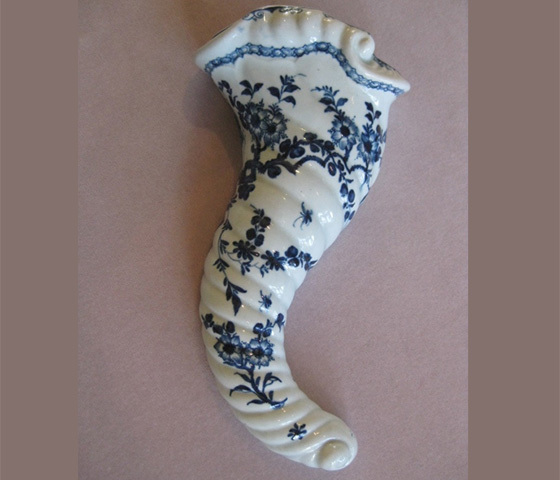 S2706: A rare Worcester conucopia of press moulded form and painted with the " Cornucopia Prunus" pattern ( B.F. & S. IE18 ) Unusual workman's mark to the back. 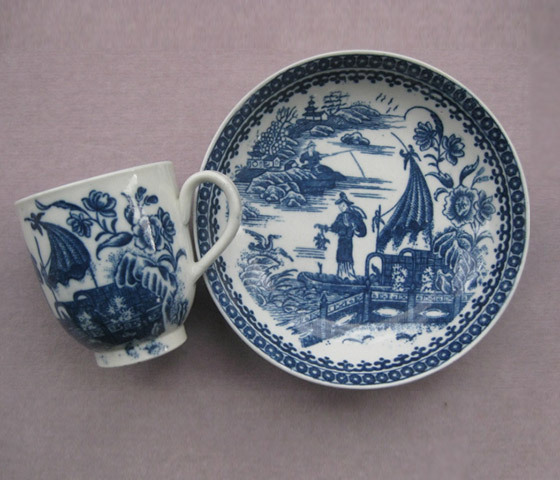 S2804: A Caughley cup and saucer printed with the Fisherman pattern. 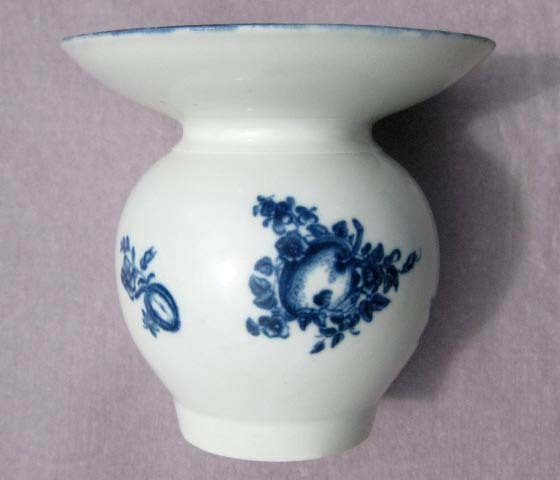 S2989: A rare blue and white Caughley spittoon decorated with the “Stalked Fruit” pattern. 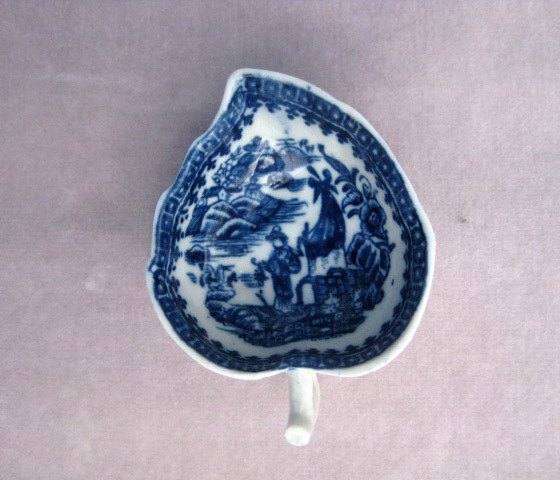 S2990: A Worcester slop bowl printed with a very clear print of the “ Fisherman” or “Pleasure Boat” pattern. Unmarked Circa 1780 Length 3 "